I have never been comfortable with the idea of throwing away any item without stopping to think if there is anyway to reuse it at least one more time for a different purpose. 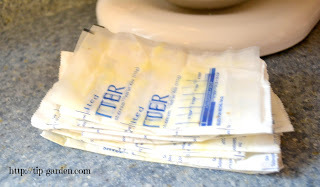 I mean, hey, I recycle cereal bag liners, so the thought of throwing away a butter wrapper without using all the bits of buttery goodness that are still on the wrapper is unthinkable to me! So, even though it drives my husband crazy, I keep a ziplock bag of the wrappers (folded in half) in the door of the refrigerator, and grab to use in lots of ways. For longer storage keep in the freezer, then just warm the folded wrapper in the palms of your hands for a moment before using! I thought I'd share a few of my favorite ways with you today. Jan's tip: When you first start saving your wrappers it is very hard to remember to use them, so do what I did: Put a note on your non-stick cooking spray can to remind you! 1) Grease pans: Next time you need to grease your baking pans grab a butter wrapper. It usually has just enough on the wrapper for a light coating. 2) Press down rice krispie treats: When making your next batch grab a wrapper to press them into the pan, Same goes for popcorn balls. 3)Instead of non-stick spray for cooking: Next time you need to saute something or lightly grease a skillet, grab a wrapper and wipe it into the pan. 4) Separate Hamburger patties: I usually make a large batch in spring for our outdoor grilling season and store them in the freezer, butter wrappers are a great way to keep the patties separated. 5) Microwaving Potatoes: Wrap a small potato with a butter wrapper (make sure to poke potato with a fork first!) when microwaving , the skin will come out butter soft. 6) Lightly Buttered Toast: I am trying to learn to use less butter in my eating, and using the small amount that is left on the wrapper to use on my toast is the perfect way to reteach me how much to use on a slice! 7) Butter tops of fresh baked biscuits and breads: When bread comes out of the oven, grab a wrapper and rub it over the tops! Yummy melty butter soaks right in to the warm and fluffy bread! 8) Coat Your Cast Iron Skillet: After wiping out your skillet, use a butter wrapper to rub a little butter back into the skillet, to keep it nice and seasoned for the next use. 9) Set a wrapper on a stack of Pancakes or waffles: Stack 'em high and set a wrapper on top to keep them buttery without loading a ton of butter on them. You can also put a wrapper on top of a bowl fo rice or potatoes before serving too! 10) Corn on the cob: My favorite way to use them in summer is to hand everyone a butter wrapper and let them coat their corn on the cob with one. It coats them quick and easy! How do you reuse your butter wrappers?